If you’ve been around long enough, you’ll know that trends come and go. One day pin straight hair is in, the next thing you’ll know, perms are already all the rage. However, it also doesn’t hurt to have the means to change up your look every now and then. This is especially true if you’re gifted with heat styling tools. You can easily have silky smooth tresses like Mulan today and maybe opt to have Merida’s voluminous curls a few days later. All you need is the right tool to get it done, and luckily, you have tons of options for such. While there are lots of great hair straightening tools to choose from, finding a wonderful curling wand can be a bit of a challenge. If you want those really tight and tiny curls that almost look like the real thing, one good option that you can look into is the Lee Stafford Chopstick Styler. 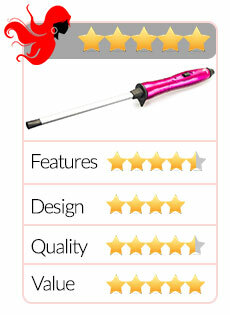 Lee Stafford Chopstick Styler Curling Wand – Now at Amazon! Created by the award-winning hairdresser Lee Stafford, the Original Chopstick Styler has received a lot of love from users as it is very straightforward and can effectively create corkscrew curls that will give you the voluminous head of hair that will quickly transform your look. Its main feature is its rectangular, very thin barrel that is designed to give you really tight curls. There’s no clamp to hold down your hair so you also don’t have to worry about getting any unsightly creases in the process. The Lee Stafford Chopstick Wand has a very simple concept. In fact, it looks like your regular curling iron, except this one ditched the clamp and comes with an easy to grip, hot pink handle. Like other curling wands, the barrel heats up to provide the high temperature your hair needs to curl. You just need to wrap your hair around the length of the tool, wait for a few seconds, and that’s it. The actual curling process is very short and you will have to spend more time in portioning your hair. To ensure the effective and even distribution of heat, this product has a ceramic coating for its skinny barrel. This also makes it suitable for all hair types and guarantees smooth and silky results. When curling your hair, you’ll want to use more heat so the styling will hold. This is especially true if you have stubborn, thick, and coarse locks. 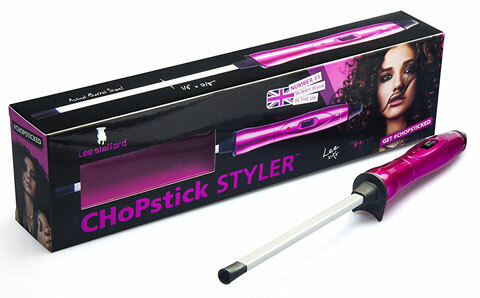 The Lee Stafford Chopstick Styler can reach up to 450F so it guarantees effective hair curling. A few seconds with this tool can already give you some nice curls. To provide better control and keep you from burning the tips of your fingers, this curling iron is equipped with a cool tip. You might still need to wear a heat-resistant glove if you want a more polished result, though. As this unit only has one heat setting, all you’ll really need to know is whether this tool is turned on or off. Its LED indicator light gets this job done effectively. If the light is on, then you can be sure that the unit is hot and ready to use. If you don’t have a heat-resistant pad yet, you can always use the built-in safety stand of this curling iron. This will keep the hot barrel away from your countertop, preventing any accidents from taking place. Maneuverability is not an issue with this Lee Stafford hair tool as it comes with a swivel cord that makes it easy to position whichever way you need it to go to curl all your hair with ease. Get Your Lee Stafford Chopstick Styler Curling Wand Right Here! With a promising set of features, you might also want to know the advantages and drawbacks this product has. To help you learn more about these, check out the lists below. It offers a quality perm-like result without the commitment. With the 70s coming back, you can expect more and more women sporting curly locks in the following months. If your hairstylist advises against you getting an actual perm, this can be the next best way to sport the trend. A finalist for the 2015 Beauty Magazine Awards, you’re pretty much guaranteed of the high quality of this tool. It works fast. You can start curling your hair seconds after you plug the unit in. This is a great thing because curling your hair will take some time, so any second saved is already a great plus. It’s suitable for all hair types. However, due to the high heat, those with fine hair should proceed with caution. Also, don’t forget to use a heat protectant so you can be sure that your hair will stay healthy despite exposure to high heat. The curls will hold for a few days. If you have stubborn, unmanageable hair, this can be the solution to all of your woes. 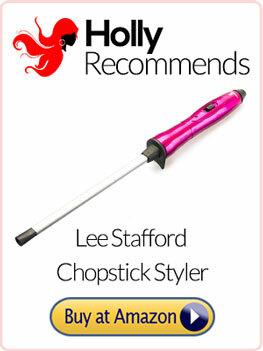 You can easily purchase the Lee Stafford Chopstick Styler on Amazon so you can already add it to your cart right now. It can burn your fingers, so it’s best if you can wear a thermal glove while using this to curl your locks. Every curling wand tends to have a slight learning curve, especially if you haven’t used one before. You’ll get used to how to maneuver this product easily, though, so you shouldn’t worry about its use at all. If tight, corkscrew curls are what you want to get, the Lee Stafford the Original Chopstick Styler Hair Tong is a product that’s hard to beat. It can get the job done marvelously, not to mention guarantee that your curls will last for days, giving you a chance to live with bouncy, curly hair without having to deal with the difficulties of maintaining it permanently. Get Your Lee Stafford Chopstick Styler Curling Wand For Professional Tight Spiral Curls on Amazon!